There were a few warts, to be sure. But this is one dirty secret of the wine world: most wines, even great wines made to mature like top Bordeaux and Burgundies, turn with age into a higher percentage of duds than we want to admit. People who attend these tastings rave about the best wines, and don't mention the ones that taste ashy or flabby or downright weird. What's impressive about this is not so much the 4 Excellent wines, because you and I might not share the same tastes. It's that only 2 were outright failures. If you take 20 relatively random chosen wines of any type, any price level, any country, from a single randomly chosen vintage at least 14 years ago, you will likely get a higher failure rate than that. Now, maybe you're a Burgundy fan who prefers savory Pinots that aren't fruit-forward. 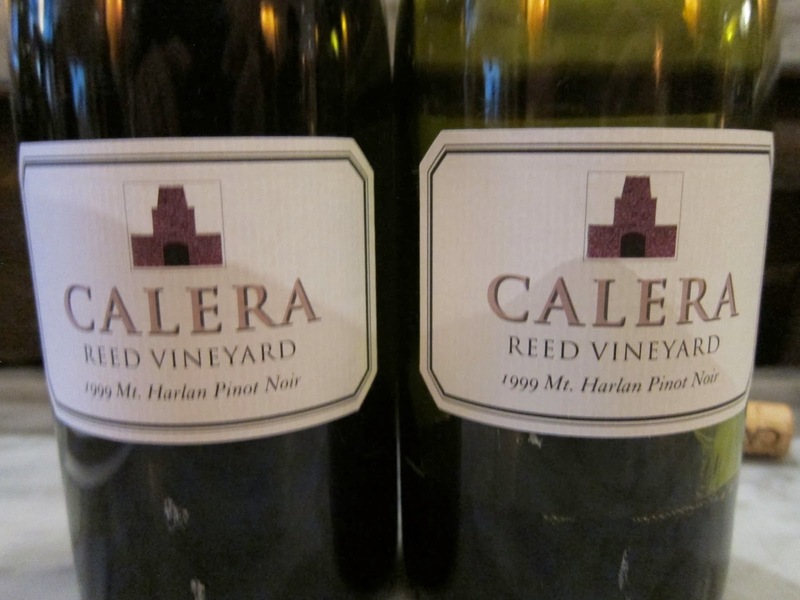 The great majority of West Coast Pinot Noirs are fruit-driven. Maybe you wouldn't love these wines on release, or 14 years later. I respect that; on some wines, I would agree with you. But that's not the point proven here. The day before, I tasted the current releases, mostly 2011 vintages of these same wines, in order to get some perspective on the '99s. I'll get to the '99 Pinots I loved in a moment, but I'll use one I didn't love -- but graded as Good -- to show what I mean. Talley Arroyo Grande Valley Estate Pinot Noir 2011 is big, potent (14.5% alcohol) and oaky. I'm not a fan. Not my style. Talley Arroyo Grande Valley Estate Pinot Noir 1999, from magnum, is riper than I want, powerful (14.2% alcohol) with just the beginnings of secondary characteristics. My point is not how delicious this style of wine is; my point is that if you like this style of wine, there's no reason to believe it won't taste just as delicious to you in 14 years. Acidity and balance are the keys to longevity. Really vibrant, ripe, fruit-forward Pinots can still have that; it's what California gives. 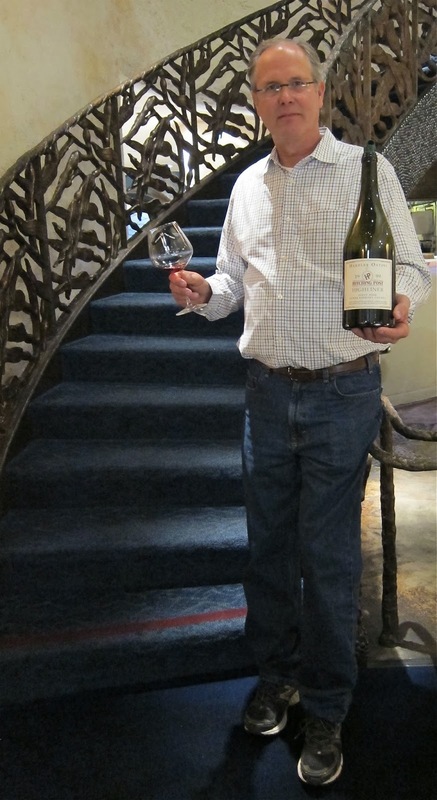 Hitching Post "Highliner" Santa Barbara County Pinot Noir: This was the wine Miles made famous in "Sideways." A couple years after the movie hit, Frank Ostini and Gray Hartley ramped up production and the first time I tasted it, three years after the movie, I didn't like it. The 2011 ($30) costs more than the wine used to, the price of fame, but it's a nice Pinot with lively raspberry fruit, some savory notes and a very fresh finish. And the 1999 shows why Miles liked it in the first place: it has good depth of flavor and mouthfeel, but it's still very fresh and varietally accurate. You're sitting at the bar by yourself, you're in love with a waitress ... why order anything else? It all makes sense now. 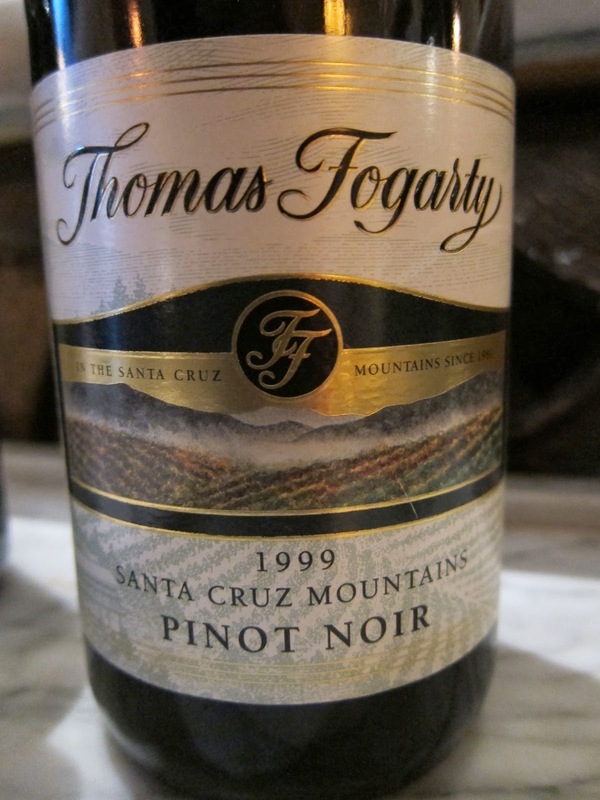 Thomas Fogarty Winery Santa Cruz Mountains Pinot Noir: The 2011 ($30) is a fine wine for California Pinot lovers not in the Laube/Parker school of heavy = better. It's light and pretty, with floral and berry notes, just 12.9% alcohol. How could such an ethereal wine age? Beautifully, it turns out. The 1999 (13% alcohol) is still very fresh, pretty, and even more fruit-driven than the '11. If you liked the '11 style now, you'll probably like it in 2027, or maybe even 2047. 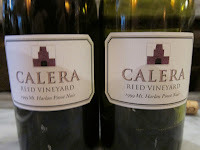 Calera Reed Vineyard Mount Harlan Pinot Noir: This is a gimme, as everybody knows Josh Jensen intends his Pinots to age. He poured a different 2011, so I can't compare, but the 1999 Reed was one of the stars of the show, with great texture, savory notes, fine balance and the right level of fruit. He has a vision, and you can taste it. I wrote down the label alcohol percentages of all the wines. I was expecting to find a clear pattern of increasing ripeness, as a bunch of us noticed once when Handley did a long vertical tasting. 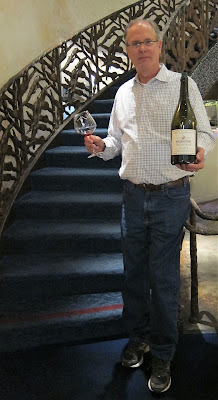 But perhaps because most of the current release Pinots were 2011s, I did not. That may be because of the wineries represented, but again, these weren't cherry-picked for style, just for bottle availability. 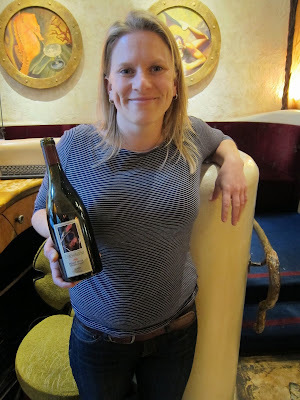 European-style family successions are still very rare in American wineries, but Wynne Peterson-Nedry has taken over from her father Harry at Chehalem, and it will be interesting to see where she takes the winery. The current-release 2010s from the estate Ribbon Ridge Vineyard she poured show a potential crossroads. The main label wine, which she called more "feminine," tastes prematurely old, whereas a new "RR" brand version with a cheezy label, which she says is supposed to be "more structural and tannin-based," is terrific, with a great mouthfeel reminiscent of the dense-without-being-heavy 1999 wine. Maybe nobody in the US wine industry (save Josh Jensen) cares about what ramifications the choices you make today will have on the wine itself in 14 years, but it is interesting to see the decision laid out so starkly. You could pour the Hartford Family Winery Arrendell Vineyard Russian River Valley Pinot Noir 1999 and 2011 side-by-side, and I'm not sure how many people would guess which was which. The '99 actually tastes richer with chewy tannins on the finish. Another one I'd like to revisit in a decade. But it does raise a question: if the wine tastes like it was just released, did you rob the cradle by opening it? Did you waste 14 years waiting to open it? What are you doing with your life? 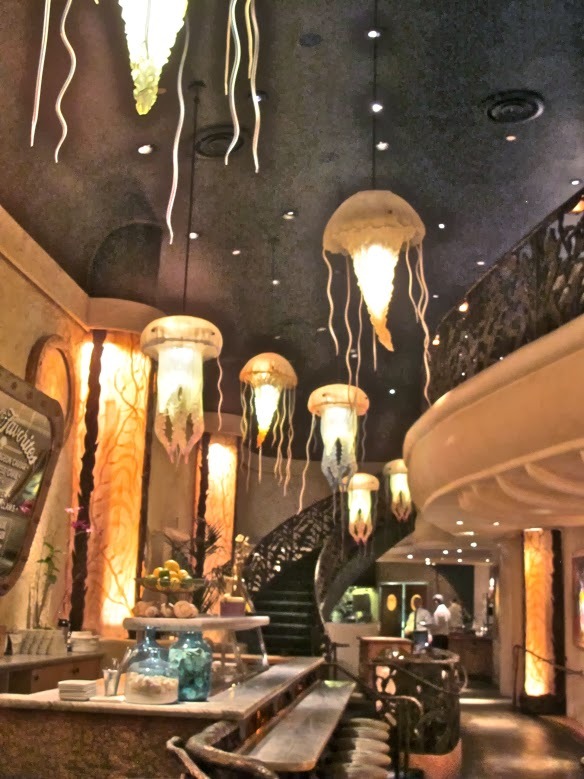 Whatever the answer to that is, wow, do I want a jellyfish lamp from Farallon for my apartment. 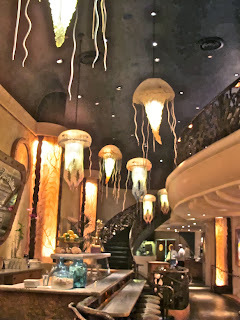 Those are jelly fishes. You'll poke your eye out. Isn't the whole point of aging a wine is to let it develop more complexity and nuance. Please forgive my naïveté of which there is plenty with regards to Pinot noir. It sounds like most of these wines taste the same as they did on release-so why age them at all?